Before earning the Nuova Point seal, every product undergoes a process of intense testing to ensure it is capable of withstanding the most demanding of applications. They must resist regular washing and washing liquids (including bleach) without discolouration or affect on their velvety surface. Great care is taken with the upper rim – to withstand chipping and cracking from thermal shocks – as well as to the egg-shaped inner surface of the cup, designed to ‘cradle’ the espresso. 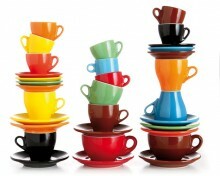 Click the button below to add the Nuova point color Cappuccino cups made in Italy to your wish list.